Allowing for a more efficient option is always good economic policy. If we're going to intentionally create economic churn for churn's sake there's not many worse options than paying people to drive in circles. The bus works, as does LRT and UBER etc, but a vibrant contemporary city has more options, not less. As this bike share is only going to be downtown, will the rest of the city's ratepayers need to pay for your luxuries? The bus comes every 15 minutes at best, is slower than a bike downtown and doesn't go where you want to go? Incorrect. The idea is to have key areas of Central Edmonton covered. What that means at the moment I am not sure, but likely Downtown, Old Strathcona, Oliver, Garneau etc. Highest use potential, most destination potential. Maybe have electric bikes and snow bikes. Is any city doing that? Toronto's system is 75km2, Hamilton's covers most of the lower city. 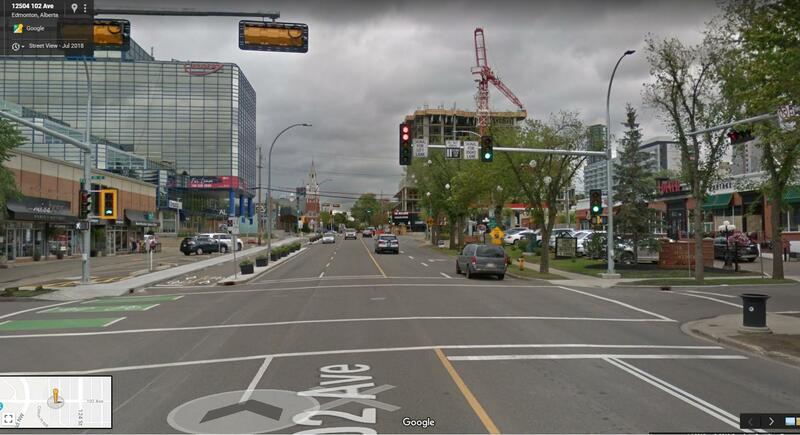 For Edmonton I would guess Argyle to 118ave, 75st-142st as a minimum. Could easily be more. A stage 1 would likely be much smaller than that. Lots of cities have at least some electric bikes. Not snow bikes, though, neither fat or studded tires that I'm aware of. More likely to see a smaller fleet through the winter when there are fewer users. private venture... so what your telling me is absolutely no money from the tax payers, just like the Arena was a private venture? Very little. Certainly some amount of admin time to get the RFP, regulations, etc. set up, but the usual model now is from then on, private firms come in and run things. Only if it's limited by city council to a certain number of bikes like some cities have done. Your proposed area is smaller than what Pogo covers with just 50 cars. - Sobi Hamilton launched in March 2015 with 750 bicycles at over 100 stations. Calgary unfortunately capped their pilot at 750 bikes per operator with a minimum of 250, with the possibility of several operators with different service areas. Which is why the private model works, let them go wherever they believe it will work for them. That's an interesting idea. Since bike share bikes are generally heavier and built for urban cycling/commuting I wonder if a 2nd provider could swoop in with something closer to a trail bike for river valley adventuring. For sure, but it works best if there's only one provider so you don't need multiple apps/subscriptions/accounts to get everywhere. Or one provider with 2 different types of bikes that can be docked at any station. Whatever works, but there's an opportunity here. I fully support the bike share concept but it is exceedingly difficult to carry out without subsidies. Not learning from the multiple failures of other bike share programs in cities with a much greater bike friendly climate and mentality, is sadly doomed to fail. It can be far cheaper than the endless subsidies for other forms of public transit but setting out the scope and proper regulations to any bike sharing scheme is critical to any chance of success. Since 1994, many community projects around the country have attempted programs similar in nature to the Yellow Bike Project, most of which have since been abandoned. Originally, the program's founders hoped to completely finance the program by selling advertising space on the bicycles, which was placed on the bike's frame and its solid disc-type wheels. This funding source quickly proved to be insufficient, and the city of Copenhagen took over the administration of the program, funding most of the program costs through appropriations from city revenues along with contributions from corporate donors. Since the City Bikes program is free to the user, there is no return on the capital invested by the municipality, and a considerable amount of public funds must constantly be re-invested to keep the system in service, to enforce regulations, and to replace missing bikes. Or bringing back the Centre Free LRT. Hop on, hop off. And you wouldn't even have to get down to the platform on the Valle Line. It seems to work OK in Calgary, Salt Lake City, Portland, etc. This is not a mutually exclusive situation. It seems like the issue with those failed bike-shares is that they were free. The ones that are courting the city right now are all pay per use, which in addition to advertising dollars, should pay for itself. This isn't a city trying to stand up its own platform and business case, it's a business ready to dive in with an already working business case, platform, supplier, etc. because they see a way to make money. Barring any wild and obstructionist regulations, that is. You can rent bikes (road/mtb/fat) from Revo, and I think United Cycle is now doing this, and likely others are/will follow this trend as its been quite successfully from what've heard at revo. Absolutely, but those are $50+/day and I'm sure require a deposit. Bike shares are more like $15/day or like $3/trip under 30 minutes. Or they could go to a per km type if so inclined. They're also available without having to go to a United or Revolution Cycle. Barrier to entry is very low. Even if the cost per day is higher for that type of bike, it's still probably the better option for tourists. I'm all for more bike rentals from local shops though. I don't even know if their business would be cannibalized by this if they're offering more specialty bikes vs just some off-road capable bikes for casual users. "Very little" Hogwash plain and simple because a "study" undoubtedly would have to take place first to see whether it was "viable" thus dispensing with the first $25,000+ followed by lord knows what. Human behaviour doesn't change that quickly. It takes time. Pilots are best run on 3-year cycles, and adjusted to respond to data. We're in what just over 1 year for the downtown and 102 and 83 ave networks? Spoken like someone who hasn’t gotten a clue. My son and I walked down the 83 ave bike lane today and there were more bikes than cars that passed us. This is quite common along 83 ave, but I don’t hear anyone saying we should close the road because it’s not being utilized enough by vehicles. Nationally, the percentage of people who say they use a bike to get to work fell by 3.2 percent from 2016 to 2017, to an average of 836,569 commuters, according to the bureau's latest American Community Survey, which regularly asks a group of Americans about their habits. That's down from a high of 904,463 in 2014, when it peaked after four straight years of increases. In some cities, the decline was far more drastic. In Tampa, Florida, and Cleveland, cycling to work dropped by at least 50 percent, although in some cities, cycling to work was up just as dramatically. Seems that they don’t even have a good grasp on what’s causing the fluctuations but the standard response from the advocates is just add more money. I assume that there are now traffic count statistics available for vehicle and bike traffic, right? Those should provide some indication of the volume and effectiveness of various routes. For me, bike theft is too rampant to consider using my expensive trail bike to commute or run errands in this city. I don't want to have to carry 10lbs of locks and spend 5 minutes at each end of a journey making sure my bike is secured just to pick up a carton of eggs at the Save-On. So a dockless bikeshare would be super handy for me personally. Also, I really like Ken's idea on a bike being a valid fare on ETS. ^bingo... and the convenience factor would expand the reach of this to so many more folks out there. At $3.25 for 15 min? Oh wait since bus fare is going up to $3.50 soon, I'll pass thanks. As it's privately funded I have no issue with the plan. How do you pay? I assume it's via a smartphone app? That's what I gather from my research. But $350 for 15 minutes? Hardly worth it. Bikeshare reports at Council today... curious to see what comes from this. What kills it for me is the fare. I assume the fare will be a similar structure as ETS fares. At $3.50 for adult (15 minutes in some municipalities I've seen) isn't cost effective for the average user. My commute takes me an hour from Clareview to 107/124th street. That's ~ $15.00 one way! My seniors bus pass is $15 month! When I get my GIS my annual bus pass will be something like $57. I'm sure council had a look at Calgary's test project. Perhaps Insight has done a survey about this or we will. $2-4/hour seems like a reasonable price to me. I'm not sure how anyone would expect a company to survive for much less than that. As far as commuting across the city, that's not what the system is intended to be used for. This system isn't intended to replace cross-city bus or LRT service. It's to fill the gap on shorter hops, whether that be in central areas, or potentially in far flung areas from bus stops or LRT stations to final or initial destinations. Further, it seems a lot of them offer monthly or annual passes for frequent users, no different than bus passes. Vancouver is $10 for a day, $75 for 90 days, and $159 for a year's pass and that's with free 60 minute rides and what I would assume charges if it's not docked, but like Montreal I remember you can just dock before the 60 minutes is up and grab a new bike and keep doing that and going all day. A good meeting with Lime Bike today. Looking forward to next steps. wow, look at all this content you shared. Was there a lunch involved too? Telling C2E it was a good meeting is pointless, or merely a humble brag, which seems to be a lot of your posts here. Use your twitter to record your daily activities. If you have something to add outside of a humble brag, perhaps provide that. ...or, that's the update and that things are happening behind the scenes. I am not directly involved, but this is very positive. Thanks for your post on my post bitching about IanO need to use this forum has his personal blogging space and not adding any content. I just came out of a meeting too. It was very good. Positive steps, can't wait for the next one. Odd, last time I checked this was a forum to update, share when possible and discuss. Odd, your post that I'm complaining about didn't have an update, didnt have anything to share, and certainly nothing to discuss, outside of the fact it was a good meeting (what ever that means) and looking forward to next steps. I'm all for sharing and updating, but your post did none of that. Perhaps you can elaborate what made it a good meeting. What will the next steps include? If Lime Bike is the same company already operating in Calgary this sounds promising. Most of us have our own bikes. But the whole locking and unlocking thing when using them for short commutes (as opposed to longer recreational rides) is a pain. Bike shares seem like an attractive alternative for just some work day commuting around town. I am so sorry that my content didn't meet you needs, my sincere apologies. Wow, that's sarcastic at best. You had no content. It's not that your content didn't meet my needs, its that you're just posting nothing. Meeting was had. Next steps. This week I was in Vancouver for work and decided to give their bike share a try. The app was easy to use and very self-explanatory with 3 pricing options. Fully up-front about what was included and when you would be charged extra. The app gives you a unique code to punch in on any bike. It was $9.75 for a day pass, which included the first 30 minutes of each ride for free. After 30 minutes you're charged $5 per additional 30 minutes. Now if you're paying attention, you can game the system by stopping at a docking station, locking the bike up (i.e. ending your ride), then immediately unlocking the bike again and continuing on. This was my strategy as I intended to ride from my hotel down to the waterfront, then do the full Stanley Park loop. All started well once I located one of the docking stations. There were probably 15 bikes there, most of which included a helmet locked to the basket. The # of bikes was not surprising as it was a very central location. The bikes aren't anything special, but they're comfortable enough with adjustable seats, a bell, basket, 5 gears (i think), a lock that pulls out of the handlebar and locks back to the frame, and both front and rear lights. The app includes a map which shows each station and how many bikes are currently there. I started a separate 25 minute timer on my phone and went on my way. I probably passed 4 stations just on my way to the waterfront on the separated bike lanes. Very good experience overall. Got down to the loop and noticed that it was also separated. One level for pedestrians and another for cyclists & rollerbladers. Tons of signage and wayfinding as well as markings on the pavement to direct people. There were a few more stations located along the seawall, and I assumed I'd reach another one before my timer went off, so I just continued on. Shortly afterward the timer rang and I stopped to check how far I was from a station. Turns out the ones I had passed were the only ones I'd see until basically the end of the loop. Finished the loop and found another station to lock up/unlock at, then made it all the way back to my hotel before that 30 minutes expired. All told I spent $14.75 for about an hour and a half of cruising around Vancouver. Now that seems like a lot, and if I wasn't a tourist I'd agree. But if I expected to use the bike to ride to work, run out for lunch or dinner, go for a quick cruise, and maybe run an errand it would have been $9.75 for a full day. Not terrible considering the skytrain was like $9 from the airport during rush hour. WTF is up with this intersection. "SIGNAL FOR LEFT LANE" + "SIGNAL FOR RIGHT LANE"
I get the history - high street fought for the left turn. But man this is poorly executed. There are so many traffic infractions whenever I drive through here...left lane cars going straight through ignoring the red light "for left lane"
Signage is even more useless in the winter when the lines are covered. ^yup, has me puzzled as well. Not really sure what it's trying to do but during the rush hour it creates a ridiculous pinch point. It certainly doesn't help that construction for The McLaren has made 102 Ave Eastbound their own for a year or so. I don't even go that way after finding it blocked so many times, and I bet regular west-east commuters have learned not to too. This is the worst signal timing and design. The entire mess could be sorted by installing yeild signs for the bikes at that intersection... exactly like they have for the next 10 blocks to the west. Instead they install a ridiculously confusing set of single lane fixtures with signage and completely screw traffic for both wb and eb traffic. It is so frustrating. Traffic backs up well past the museum in the morning due to this. It is also dangerous because it causes confusion for wb to sb left turning traffic. The cars waiting to go straight in the eb lane that turns red, cause sight line issues and im sure some wb left turning trafic assumes that both through lanes would be red at the same time and this could cause a bad accident. There are large problems in the signals department. I've never understood this implementation, either. Personally I'll change lanes when headed East bound so I'm not violating the double red light in the left lane. But approximately 95% of Edmonton's drivers just sail on through. ^Please e-scooters! Last 4 cities (Austin, San Diego, Seattle, and Denver) I've been to all had them! Don't know if this is on topic but has anyone on this thread had any experience with folding bikes? I'm considering one. I know folks who have them for travel or ease of use on subways in Toronto/NYC and they love them...but they are limiting as per design.